Kick open the door. Kill the monster. Steal the treasure. Screw over everybody you come in contact with. Welcome to the world of Munchkin! 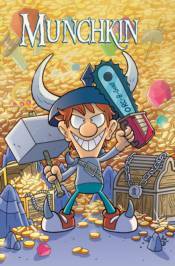 Based on the popular game series, Munchkin Vol. 2 collect stories from the world of the fantasy roleplaying satire, featuring a time traveler, Spyke and Flower relaxing for a movie night, and the duo adventuring through a post-apocalyptic world. Collects issues #5-8.